Grain Valley, Missouri — Russ Wood returned to the track after five years away from the driver's seat to record a closing 3rd place finish in the 25-lap B-Modified division feature Saturday night at Valley Speedway. The veteran pilot, who had retired as a driver after an abbreviated 2005 schedule to work as a car chief and chassis consultant for Wood Racing and several other Midwestern teams, made clear he intends his informal "comeback tour" to be a sharply competitive effort. Wood, 51, a former NASCAR All-Pro Series Rookie of the Year candidate with a host of wins over a nearly 40-year career, started 21st of 23 entries in the main event for B-Mods over the 3/8th-mile dirt track in central Missouri. Slicing rapidly through a tightly matched pack, Wood overcame 6 caution flag position resets to emerge into the clear behind the two breakaway front runners with just over 2 laps remaining. "We had to pass a few of those guys 3 or 4 times," he joked afterwards, "but I probably needed the practice anyway." His distant starting spot the result of a heat race disqualification for a missing scoring transponder, Wood advanced quickly to the 15th position in the early laps of the feature. Shortly thereafter, his #14 tangled with a competitor and spun after chain-reaction contact from behind. Sent to the rear for the restart, Wood had recovered the lost ground by the time the next caution waved for trouble on the race's 9th circuit around a Valley course that was patchy with both heavy and dry-slick spots after uneven recent weather in the area. "I felt like we had the setup figured out pretty good for the conditions," Wood explained, "so my biggest worries were just being patient working the traffic to get up front, and watching the temp gauge – the motor ran a little hot all night. That'll be the first thing we work on when we get back to the shop." Water temperature in the #14's Ford power plant climbed toward 250 degrees as Wood powered through the tight turns at Valley, but it didn't seem to slow his charge. With 10 laps to go, Wood was sitting 6th as he used yet another yellow flag period to preserve the engine and plot his way forward. When the green unfurled and racing resumed, Wood worked quickly past three more competitors and mounted a pursuit of the two leaders, including division dominator Tim Eaton in the #63. "I could just see the bumper of the black car," Wood said, referring to the #21 of Chris Martin. "We didn't have many laps left, but it kept getting bigger, so I knew I was going in the right direction." Laps ran out before Russ could close the gap entirely, and he brought his Wood Racing machine across the stripe third, trailing gate-to-wire winner Eaton, and Martin in 2nd. "It was a long break, and I didn't have a lot of practice laps leading up to tonight, so I'm happy with how we came out," Wood said inside his team's hauler after the race. "I think we'll get a better starting spot next weekend and be able to press those guys all race, instead of having to chase them down." Wood plans to continue his comeback with starts in the B-Mod class at Valley during the rest of the track's Spirit of Spring Stockcar Series, with a possible division jump to the A-Modifieds if results warrant. Other tracks potentially on his summer schedule include the nearby Warrensburg raceway, and a handful of tracks around the state, all of them dirt surfaces. He predicted that the team would "take a look at purses and how we're running and decide as we go along. For now, we're going to be back here [at Valley] next weekend and see if we can improve on tonight's run." The longtime focus of a family racing business that's spawned two generations of drivers, along with engineering and machining services for regional racers, Wood said fans and friends had prompted his return behind the wheel. "I kept running into people who told me they followed what the team did with our two younger drivers," he explained, speaking of David and A.J. 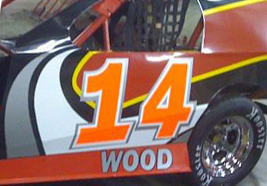 Wood, who've competed in ASA Late Model North and other high-level asphalt series in recent years, "but that the real fun was watching me mix it up in the dirt racing back in the day. And they're right – it is fun."